Do I Really Need a DSLR? August 18, 2013 Geren W. Mortensen, Jr. Lately, I've been feeling that almost everything I've got going on is getting too complicated. There's too much stuff, too many parts, too many wires, too much ... everything. In short, it's all becoming a chore, and I'm just not enjoying the things that are supposed to be fun. That includes photography. It's a big part of why my DSLR (which is an amazing camera) sits in it's bag in my office so much of the time, and why I end up subjecting the world to a large number of horrible cell phone pictures. I remember, quite fondly, using an old Konica Auto S2 35mm rangefinder. It was a camera that did just about everything well -- the lens was fast and sharp, the viewfinder was bright, and the all-manual focusing was easy. It could do manual, aperture- or shutter-preferred automatic exposure, or full auto-exposure. There was a collapsible lens shade built right in, you could hook just about any currently available flash to it if you needed to, and batteries for the meter were (and still are) readily available at almost any drug store or the local Radio Shack. Doesn't this sound a bit like my description of the perfect travel camera from a few weeks back? So, let's get back to Barney's list for a moment. At the time I bought my Sony SLT-A35 DSLR, it was pretty much the lightest on the market, and pretty close to the smallest, too. Yet, it's still a DSLR. Even with my smallest lens, it's a pretty chunky thing. There's no stuffing it in my pocket or my laptop bag; it's got to be in my hand, or around my neck. If I'm driving, it's usually on the back seat of the car, if I've bothered to bring it along at all. Finally, I have a whole bag full of lenses and accessories (visit my gear list) that I drag around with me, which makes it difficult or impossible to work quickly and/or unobtrusively (while I do have the Tamron 18-270mm PZD lens, which reduces the amount of stuff I might need to carry, I'm still just not all that happy with that lens). I do have two half-decent point-and-shoot digital cameras -- a Canon SX110is and a Sony DSC-WX9 -- which do have the capability of making decent pictures under good conditions. Being small point-and-shoot digicams, they have the drawback of having fairly typical, tiny image sensors. That means that low-light, high ISO images can be very noisy, and that control over depth of field is rather limited. You can visit my Flickr galleries of Canon SX110is images, and my gallery of Sony DSC-WX9 images for some idea of the image quality available from these cameras. You'll notice that I've not posted many pictures taken with the little Sony, and except for those of fireworks, most of the images I have posted are highly manipulated. I did take the little Canon as my only camera for a cross-country trip by rail, and as you can see from the images I've posted of that trip, a lot of the pictures weren't bad. You'll note that I didn't post any low-light images, though, and with the exception of low-light situations, I didn't feel hampered in the least by the camera for the kinds of pictures I take the most. I really enjoyed the simplicity a lot, although I did miss having a real viewfinder as it was hard to see the LCD screen on the back in some instances. I also would have liked to have been able to attach a larger flash for some shots. With that experience in mind, I've been thinking that I'd really be much happier -- and probably I'd shoot more -- with a good digital rangefinder. There are some amazing high-end point-and-shoot digitals on the market that would be nice to own, if money were no object. However only a few have traditional optical viewfinders -- four from Fujifilm and two from Canon. The Fujifilm X-Pro1, X100S, X20 and X10 (available only in limited quantities) offer traditional rangefinder styling and sturdy metal bodies, while the Canons look like fairly typical digicams and are made of high-quality plastics. If money were no object, I'd probably jump on the Fujifilm X-Pro1 with an 18-55mm lens. Money, however, is definitely a factor in any buying decision I might make, and the most basic model, the X10, is a very attractive option. The Fuji X-series fixed-lens cameras feature a 2/3" sensor, which is larger than the typical point-and-shoot sensor found in the Canon G15. They also have bright, optical viewfinders, fast lenses, standard hot shoes and sockets for a good old-fashioned mechanical cable release. Even the base-model in the line, the X10, offers an array of great, useful features, excellent image quality, and little to distract from actually making photographs. I've pretty much decided to order one, along with a few simple accessories, as soon as funds become available. The X10 Special Site has some interesting "testimonial" pages from prominent Japanese photographers which are reminiscent of the old Minolta advertisements I've written about in the past. Should Your Next Camera Be a DSLR? 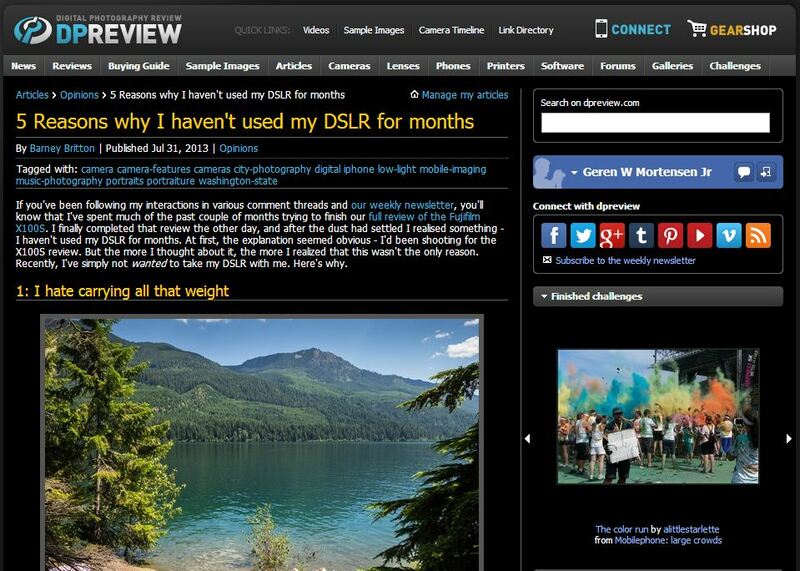 August 9, 2013 Geren W. Mortensen, Jr.
Over at dpreview.com, Barney Britton writes about why he's not using his DSLR so much any more. I can relate.